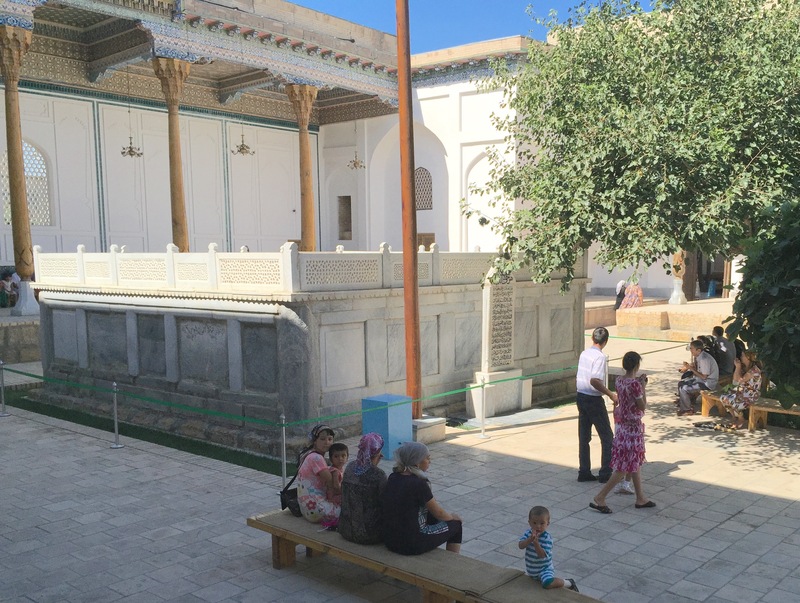 The mausoleum of Bahauddin Naqshbandi outside of Bukhara is a gorgeous and peaceful spot, full but not crowded with families making pilgrimage. A visitor can engage in a series of spiritual practices. At the tomb itself, people found spots sitting on benches under the mulberry trees, holding their hands up in the cupped prayer position. 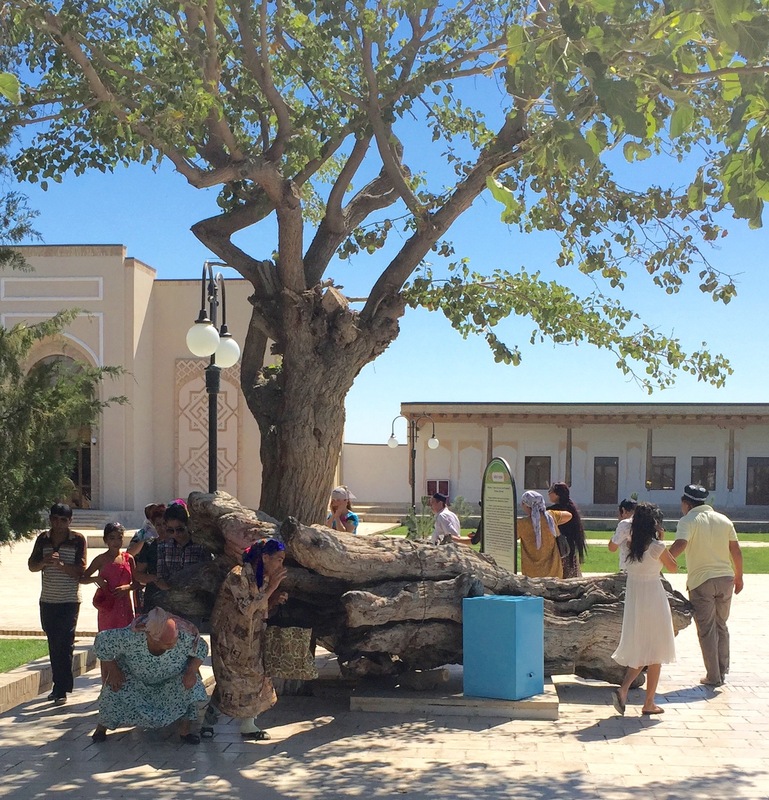 Visitors circumambulate a tree that tradition says bloomed from the walking stick of Naqshbandi. To cure back pain, one ducks under the low branches. People drink water from a holy spring. An imam chants the Qur’an before people share food they brought. On the day we were there, it was a few days before the baccalaureate exams, and the imam added an extra prayer for success for the students. If one has a particularly large request, one can sacrifice an animal. 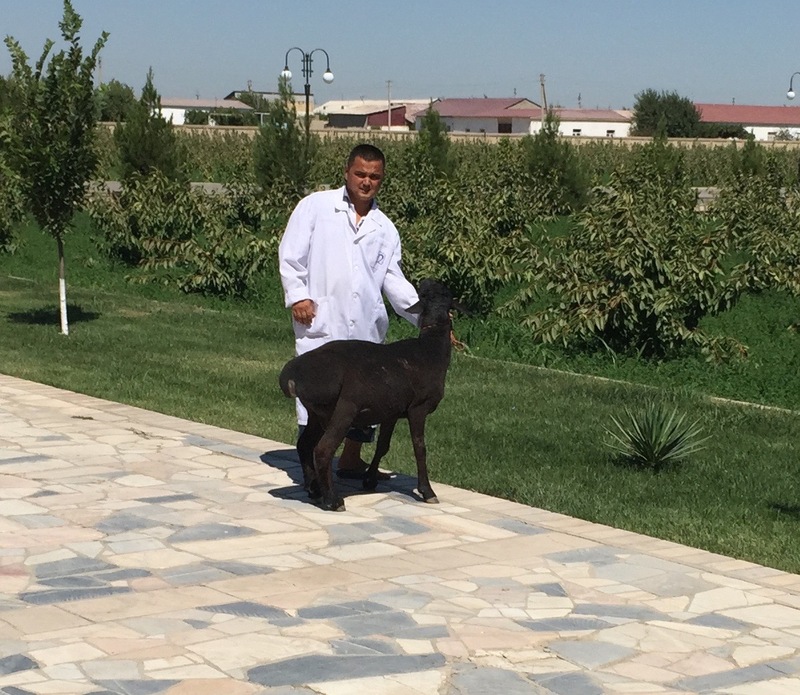 When we were there, a sheep arrived on the scene while staff arranged seats for the ceremony. We did not stay for the main event. People of all ages were there. Some focused on the religious practices, others enjoyed the shade and the park. 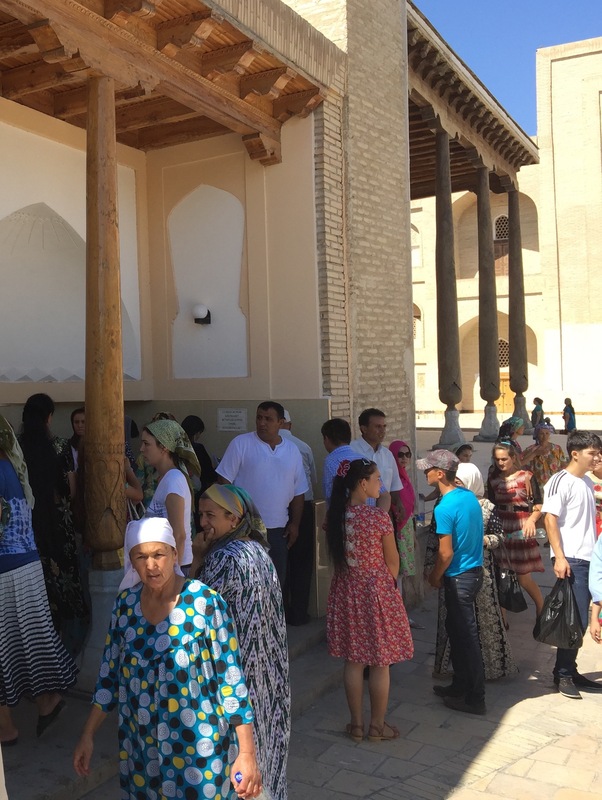 We met a group of older women from Andijan, in the Fergana Valley. They approached us and asked to take a photo with us. One woman, smiling with a mouth full of gold teeth, told us she had trained to be a French teacher but there had been little call for it in her town so she taught Russian. They took our hats and wore them in silly positions for the photo. What made us so interesting that we deserved a photo – whether being specifically Americans or just Westerners in general – I did not discover. They were smiling just before the photo, I promise! The shine is unapologetically populist in its religious practice. There is not even a gesture, as far as I could tell, to the concerns Salafis and others have about folk Islam distracting from a focus on the unity of God. Once again I find myself deeply thankful to Dr. Muqtedar Khan. I was his guest at the Jerrahi tekke, or Sufi Lodge, in Istanbul. 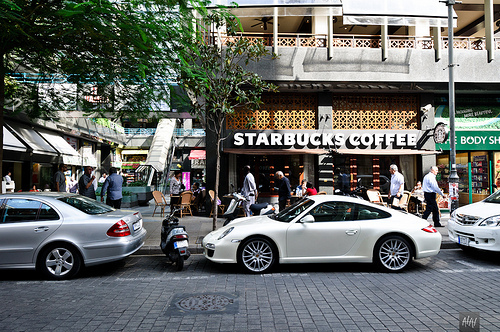 The spaces are small but rich in history. 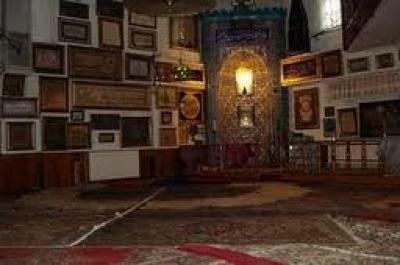 The complex has about six rooms that I saw, with the main room having some attributes of a mosque. The focus is a beautifully tiled mihrab pointing the direction of Mecca. A balcony for women surrounds several sides, and the walls are completely covered in framed calligraphy – names of Allah, the Prophet, the Companions, and the founder and leading Shaykhs of the tekke. 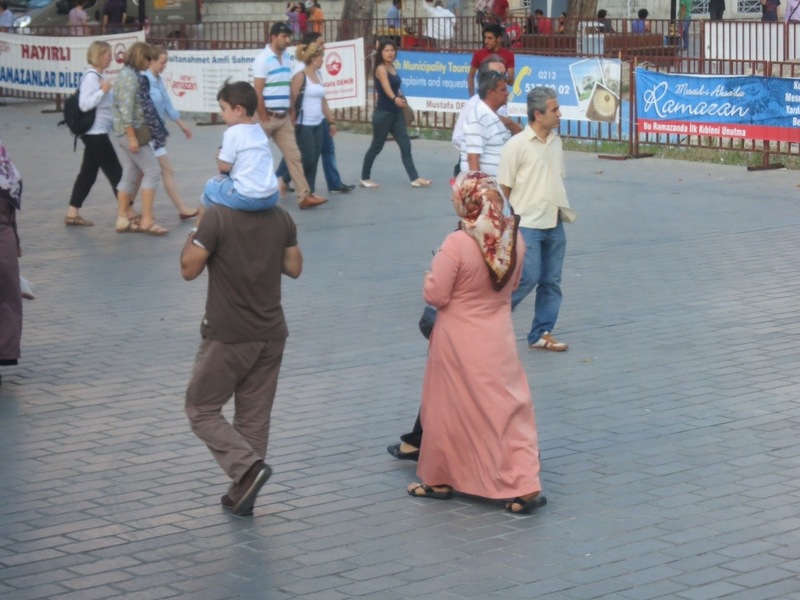 They did not allow photography, but after some searching I found this photo on a website featuring a list of tekkes in Istanbul. We entered at about 7pm to find men sitting around in small groups, most wearing white caps. Women and kids were passing back and forth through to the balcony. There was quiet talking, and as Dr. Khan described it, fellowship. Some of the men are just members of the lodge, and some are darwishes – those who seek to follow this particular shaykh’s path to awareness of God. Over the next hour the rooms filled, and at about 8:30pm all aligned to say the Isha, or night prayer. After the prayer, people shifted a bit and the prayer leaders started to sing and chant. Occasionally there were full responses from all – mostly Amen, sometimes praises to God. Slowly the congregation took over from the prayer leaders with repetitive chanting. They began to bow slightly to one side and another. The chant was very simple – often just “Allah”. Sometimes what is being chanted changed, and the volumes and speed rose or fell. Occasionally the prayer leaders sang a melody over the chant. As the chants and swaying continued, I ceased registering time. At some point those less experienced shifted into the outer rooms, which had archway views into the main room. The men into main room circled and started a different chant, this with a strong breath component. The sound was “Hu” meaning, I believe, “Him” – God. The whole room breathed as one. The circle started to rotate, with several men in the center moving counter to the main rotation. One wearing a tall light brown cap began to spin slowly, one hand up and one down. Again time was not registering. At some point the circle and the spinner slowed and stopped. The chant continued for some time, and it too came to an end. The sheik proceeded to a seat where he would deliver a sermon. We slipped out – 11:30pm. The title of this entry, “so much for modernity”, is something Dr. Khan said to me. Consider so many people, spending a whole evening together, voluntarily, “unproductively” and with no technology. I am, generally, a big fan of modernity – especially the expanding circle of empathy, the chance for improved health, and the dissemination of knowledge. It is true, however, that we must continue to strive for genuine contact with one another and with enduring truths. Today I had the privilege of hearing a lecture from Professor Cemal Kafadar, one of the leading scholars of Turkish Studies. His talk ranged far and wide, but I focused on his discussion on religion in the Ottoman Empire. His primary theme: the Empire was more deeply involved in the organization of religious practice than any prior Islamic regime. The basic roles of the professional religious were the same as in much of the Islamic world. The graduates from the madrases, the ulama, were, as they still are, religio-legal scholars. They followed three career paths: professor, mufti or qadi. Professors in the madrases, like today, would teach and write commentaries on books. Muftis were jurisconsults, very similar to rabbis giving responsa. Individual muftis’ rulings, or fatwas, would be followed to the extent these scholars were respected by their community. Thus they were not court rulings. Qadis were judges who offered binding court rulings, registered business relationships, marriages and divorces, and regulated the weights and measures in the marketplaces. The Ottoman state revealed its influence in how it ranked the madrases in three ranks of competitiveness and quality. They also created a pyramidal hierarchy of muftis and qadis, all the way from the local level to the Sheik al-Islam. They frequently used the phrase “religion and state.” Professor Kafadar gave the example, “We must do such-and-so, for the good of religion and state.” Thus the two were explicitly tied both in practice and in rhetoric. Professor Kafadar’s did not have time to discuss Sufism much, but I have seen much about Sufism in the Empire in my time in Turkey. I suspect that the Ottoman government’s heavy intervention in the official religion pushed those who wanted more religious flexibility into the alternative path of the mystical masters. Recently we had the chance to speak with a group of Turkish high school teachers and professors of education. We discussed the common concerns of teachers – serving students of differing backgrounds and abilities, preparing students for standardized tests, responding effectively to parental concerns, etc. I also had the opportunity to ask a little bit about teaching religion in the schools. Unfortunately I was not able to get into the detail I would have liked, but one point struck me. On the other hand, a friend asked another secular teacher, “Are students allowed time off during school to pray?” and she reports that the teacher seemed horrified. “No – they can pray on their own time.” And the veil is still disallowed in the state schools. If I am understanding the situation correctly, then, the schools appear to be a battleground for enforced secularism vs. enforced religiosity. 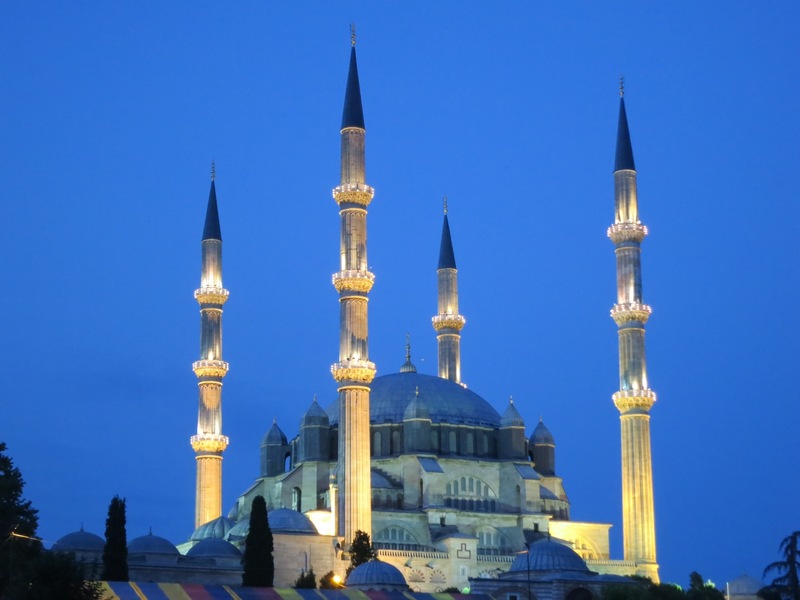 Visiting the three great mosques of Edirne gives one a history of Ottoman architecture in the 15th and 16th centuries. As time passes the expanse of the central dome grows, and simultaneously the simplicity of the wall decorations increases. 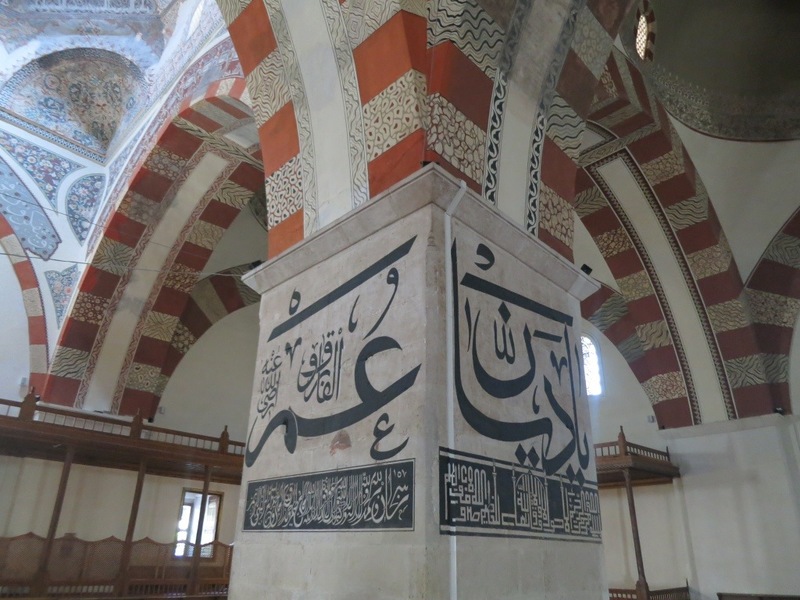 Thus in the Old mosque in Edirne, like in the Ulu mosque in Bursa, there are the huge names of God and his followers on the walls. There is less of that in the Three Balconies mosque. 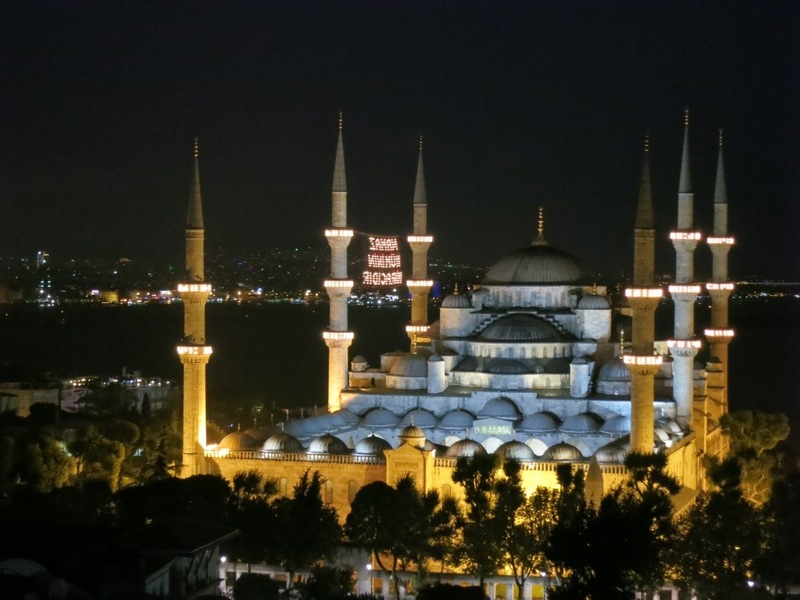 When we get to the Suleyman Mosque, there is a grand central dome, resting on massive pillars far on the circumference, while allowing a great deal of light from the sides. Sinan, the famous architect of many 16th century Ottoman buildings, thought this was his greatest building. 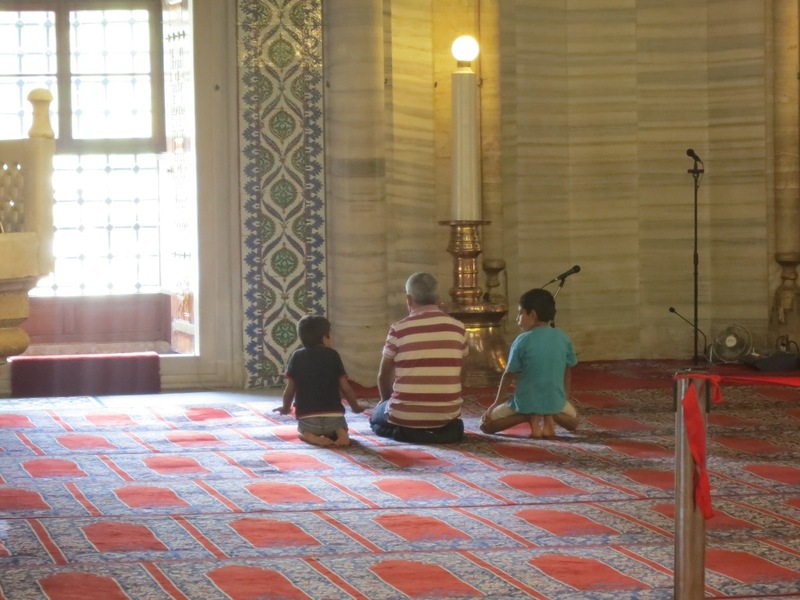 Edirne has much to love beyond its remarkable mosques. Beautiful Ottoman bridges, an elegant caravansary, and a lovely walking area downtown. 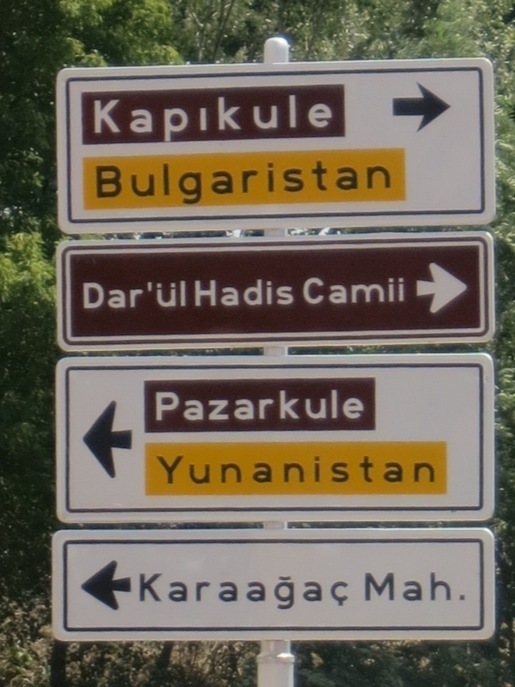 Edirne is now right on the border – signs point to Bulgaria and Greece, each just a few kilometers away. Even in historical times, however, Edirne faced Christian Europe – it was the jumping off point for any offensive (and later defensive) actions in the Balkans. Indeed, considering both Edirne’s military and architectural legacy shows just how involved with Christendom the Ottoman Empire was in these centuries. Sinan was quite consciously seeking to create a monument as grand as the Aya Sofia. 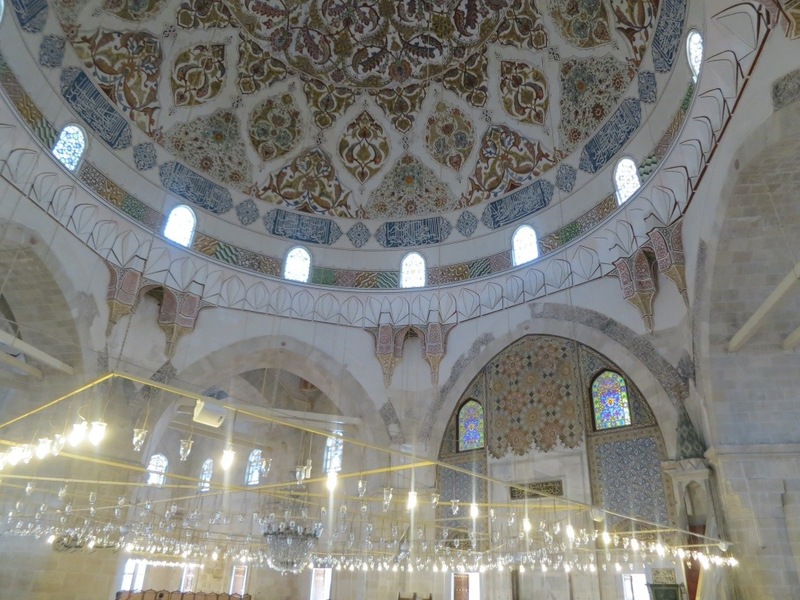 Several sultans were crowned in the mosque when they were ruling from Edirne. This is unusual in Islam they probably got the idea from Byzantine crowning rites in churches.Once the Empire conquered the Balkans and before it expanded to take the Arab lands, the Ottoman Empire was a Christian-majority empire! Istanbul between the Sultanahmet Mosque and Hagia Sophia was hopping this evening. The streets were full of families walking, kids playing with glow sticks, food vendors of all kinds, and musicians. Last year I commented on my blog that Sukkot in Israel is like Christmas. 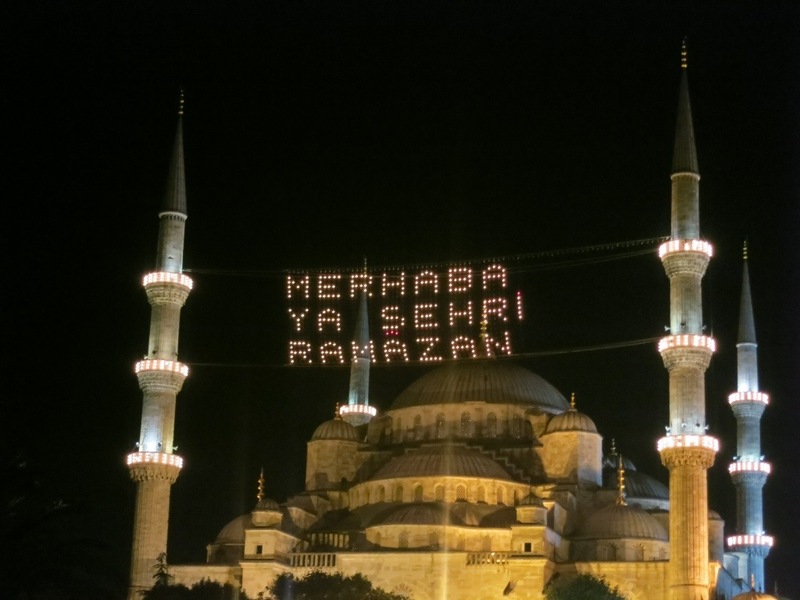 I’ve never felt the joy of Ramadan (or Ramazan as they say in Turkish) before – it also feels like Christmas…only hot and at night. On a free stage in the park whirling dervishes were dancing, and we heard the instrument that Rumi says sounds most like the human voice. Tonight I’ve been told that drummers will walk through the streets at 2:30am to wake everyone to prepare for the predawn meal. As far as I can tell not many people in this area of Istanbul will need to be awoken – I think they’ll still be up! I should say that today in another area of Istanbul there was far less joy – the police again beat and tear-gassed protesters in Taksim Square. We are far away from that activity, both atmospherically and physically. Still, my thoughts are with the people who are trying to push for a more democratic Turkey. I watched the first season of “Homeland,” and have now watched the first two episodes of the second season. As a spy thriller, I love it. But are we ever going to hear something positive about Islam? All good words are in the mouths of people who are either terrorists or being fooled by terrorists. Even the “saint” imam at the DC mosque would not tell the whole truth. The “good” Muslim CIA agent is a tiny character, and is a mix of Muslim and non-Muslim backgrounds. The preppy woman who grew up as an ARAMCO kid and loves a Saudi was a terrorist. On “Homeland” the American people have seen Muslim prayer close up multiple times, far more than almost any of them have ever seen it before. Each time these prayers have been offered by terrorists. I’ll be interested to watch “Hatufim,” the Israeli series on which “Homeland” is based, and see what of this comes from that show.